The basis of the project is Factory Five‘s proven MK4 Challenge series car. The Challenge kit differentiates itself from the standard Roadster kit mainly from its fully integrated, NASA legal cage. A robust halo bar is easily identifiable and from there, fully integrated door bars makes getting in and out of the car a little more challenging than a standard Roadster. A standard 3-link rear suspension and tubular front suspension are some of the additional items that come with the Challenge kit. We optioned a Street Completion package to make it road worthy, which consists of a second seat, carpet, and a windshield. Our Factory Five Challenge project will be built in a home garage and will be highly documented. Every time we work on the car we will update this story with our progress. In addition, there will be full tech articles on the larger portions of the build. This is where the Cobra Jet portion of the project name comes in to play. Last year we built a Coyote engine that was based closely of Ford Racing’s naturally aspirated Cobra Jet engine program. Featuring the same 312 ci Livernois block and Mahle pistons, it was filled with other go-fast goodies that allowed this Coyote to produce 624.9 hp and 462.3 lb-ft of torque – on a conservative 12:1 compression ratio. Peak power on our Coyote was at 7,900 rpm. We are hoping that our updates will push the motor to the 650 hp mark. We will be making some additional updates, including a set of individual throttle bodies, before the engine heads to its new home. Regardless, a 2,100 pound car with that much power will be a blast to drive! Stay tuned as we build our Factory Five MK4 Challenge kit car! So we dropped off a bit the last six months or so. To recap, we went into SEMA build mode with the car, got it successfully to SEMA (more on that in a minute) and back from the show. In between, we have ran into a variety of issues with the engine that has kept the car from being street worthy. Follow along with the updates below. In go kart form we were able to get the Factory Five Challenge car on the dyno. With a soft E85 tuneup, the vehicle made 533.9 horsepower at 8,000 rpm and 401.8 lb/ft of torque. With it turned up, we are guessing it will make close to 560 rwhp. Not bad for a 12:1, 312ci Coyote! But then disaster struck. Right as we were getting to turn up the power, we spun two rod bearings. The issue was traced back to being low on oil plus an improper pickup to pan clearance. When you’re moving 90 psi of oil pressure at 8,000 rpm, it doesn’t take long to hurt parts. We successfully got the car to SEMA and into the Toyo treadpass, but it had to be pushed in. Once the car came back from SEMA, we pulled the body back off, pulled the engine out, and sent it back to L&R Engines for a rebuild. We got the engine back into the Challenge car and the folks from AEM Electronics came down to finish up the dyno testing. Long story short, we had an issue with controlling the passenger side camshaft. After multiple attempts at different fixes, we are still having issues with controlling the camshaft. We believe that some bearing material got into the oil passage that feeds the oil to the passenger side exhaust cam. Eventually, we will just lock out and degree the exhaust cams so we don’t have to pull the engine (and the body) again. Today we drove the car for the first time on the street! We headed to the alignment shop and over to the local clear bra shop that will be applying a satin clear bra to keep our custom paint in good shape. We will have the Challenge car at next week’s Huntington Beach Factory Five show! Come by and say hi! We gave in and brought the Cobra into the Power Automedia offices to get the vehicle done in time for SEMA. There’s just not enough available weekends to get the project built to our satisfaction. Team Z Motorsports helped us with a mount system for the K&N carbon fiber sprint car filter onto our billet individual throttle bodies. 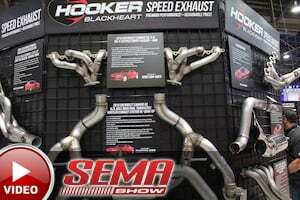 You can also see our custom made 2-inch primary GP Headers 304 stainless headers. We did make a big push at the home garage and got the engine and transmission installed. Additionally, we wrapped up the trunk sheet metal and had custom trunk carpet made. The open holes are for the wing mounts. Also before leaving we final-mounted the Tilton fluid pumps for the rearend and transmission along with the Derale dual channel fluid cooler. The first production carbon front facia from Trufiber came in and does it look sweet! We are working on a front splitter design that will be easily removable for street/track driving. After 50 hours of body work, 3rd Gear Garage has the body ready for paint. We aren't sure if we are going to paint the body on or off the car. The Challenge car is more tricky than a standard Roadster when it comes to installing the body due to its integrated roll cage. 9/8/15 – Less than two months until SEMA! Well, now we are going to officially tell you that the Cobra will be in Toyo Tire’s treadpass booth between the performance hall and wheel and tire hall. With less than two months to go, there’s still a lot to get done. We are rounding out the smaller details so we can start putting the bigger pieces together. Dave Martis from G-Stream came by to fit his carbon fiber wing on the Cobra. We are also making a carbon fiber trim plate with removable plug, so we can remove the wing for street driving. The trunk metal is completely finished minus riveting. The center will be carpeted soon and ready for final installation. Underneath, dual Tilton fluid pumps are mounted in the back next to the fuel cell. One will pump the transmission fluid and the other for the rearend. The AEM Infinity will control the pump actuation from the temperature sensors and send it through a dual channel (double stack) Derale cooler with a fan on it that sits on the opposite side of the tank. The fan on the cooler will be triggered by either fluid pump as well. Everything fits snug as a bug. Our Tilton 7.25-inch, triple plate clutch and flywheel setup is completed. We measured the standoff height for the hydraulic release bearing and plan to finally mount the engine/transmission combo for good this coming weekend. Safety for our Cobra will be handled by the pros at Sparco. For the driver’s side, we are using a Pro-Adv head restraint seat with an Evo II for the passenger. Belts are both 6-point, though the driver belt is designed to be used with a HANS device. Racing wheel, weld-on quick release and seat brackets round out the seating. The guys at 3rd Gear Garage had the complete car for a week to work out the door, trunk and hood trimming. They will begin prepping the body this week and get it 90% complete. Once the car is finished, we can mount the windshield, latches, etc. and finalize the body work before spraying. Due to the amount of positive caster needed for a power steering-equipped Roadster, we are cutting down the camber side of the arms so we can run -2 to -2.5 degrees of camber. The sheet metal needed to get the chassis as a completed go kart is about 90% completed now. The rear firewall is the largest piece of metal on the whole build. Lastly, we are close to having the brake lines completed. This is a different setup than most Roadster builders that uses Fragola bulkheads, AN fittings and NiCopp line. We are finally getting back on track! We fitted the final front facia plug, which turned out perfect. From here, the facia will be sent out to have the mold made for it. The majority of our time was spent on riveting in the passenger foot box and final drilling the floor sheet metal along with brake lines. We are using Fragola's steel AN fittings along with NiCop lines. Heatshield Products recently released a 1/4-inch Hot Rod sleeve that also works great on 3/16-inch brake line as well. Additionally, we added AEM's 2,000 psi sensors to the front and rear brake so we can datalog our braking bias. We mounted our Tilton remote reservoir on a bracket that's anchored off the 2x2-inch dash bar that will then tie into three separate bulkhead fittings to feed the master cylinders. The Lokar billet drive-by-wire throttle pedal is mounted perfectly in place with a simple bracket we made. 7/6/15 – Almost two months since the last update! Sometimes life gets busy and projects need to take a temporary back seat, though we are back on course with our Cobra and we have some updates to get you caught up on! The Cobra spent the better part of three weeks at TruCarbon while the front facia was being developed. This will be a production piece so making sure that it fit properly and without the least amount of modification was key. From here, the 'plug' will be used to create mold then the first carbon fiber facia will be built from that mold. The removable splitter will come at a later date and is fairly easy to make. Some other prototype production pieces we have been working on are lighting bezels and headers. Working with Darin at Marine Parts House, we developed new billet head and taillight bezels. The headlight bezels will be designed to hold Truck-lite's split beam LED head lamps, while in the rear, we are working on a new taillight design that takes up the entire flat portion of the taillight area that will hold a LED board. This board will simulate the dual taillight design of the Factory Five Roadsters with an outer (running lamp) halo and a center illuminating brake light. On the headers, we are working with GP Headers to test their new 2-inch primary Coyote Roadster header. Yesterday we spent the entire day working on installing our powder coated engine bay aluminum along with the Tilton master cylinder reservoir. All that’s left is the passenger foot box! Over the last two months most of our time has been spent drilling sheet metal. Next up will be brake lines, mounting the Lokar DBW gas pedal, and installing the in-cabin panels. We cut the factory 3/4-inch square bar cross bracing back and ran two, 1-inch straight bars back off the frame and intersecting the cross bracing. The bottom cage bolts in. The cell can be easily removed by pulling the back up and out from the chassis support bars that go across the front portion. If the bottom of the cage was welded in, one of those bar would need to be removed. A removable patch panel will be added to fill in the portion of the sheet metal we needed to cut out. 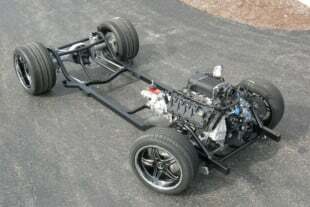 In addition we fit the Tilton pedal assembly and set the body on the chassis to check clearance of the ITBs and wheels. 4/28/15 – We made it to the Factory Five Huntington Beach Show! We made our goal of having our project at the Factory Five Huntington Beach show. There was always a crowd around the car as it was very different than the vast majority of the builds there. Luckily, our CCW Hybrid Series wheels showed up just in time. Our next major part of the installation will be the fuel system. Complete with an ATL 12 gallon tank, AEM E85 pumps, Radium FCST, Radium fuel rails, and Russell’s plumbing, the Cobra will never run into fuel starvation issues. This time of the year is busy for events and we just haven’t got the traction on building the car like we wished. Considering that we now only have 5.5 days into the build, the progress has been good. With the Factory Five Huntington Beach show this Saturday, we wanted to get the motor sat into the chassis and have the kit as a roller at the event. Our wheels should be here tomorrow. Friend and professional drifter Justin Pawlak came by for a half day to lend a hand with the build. He tackled the rack and steering system. Of course the eye candy wouldn’t be complete without the InnoV8 individual throttle bodies strapped on the Coyote. We also swapped the oil pan and pick up for our updated Moroso baffled oil pan that’s designed specifically for the Factory Five cars. A standard Coyote pan sits far too low. The Moroso pan adds the volume via the width and removes about two inches of overall height. Last weekend we were covering the NMCA Fontana season opener and didn’t get a chance to put any time into the build. Yesterday, with the additional help of our shop guy Dean, we put in a combined total of 20 hours. As you can see, we made some progress. 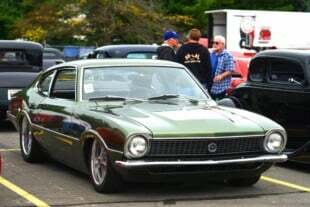 Factory Five hosts an annual show in Huntington Beach at the end of April and we are trying to get our Challenge car there as a roller with the engine set in. As long as our wheels make it in time, we will be good to go. The suspension is about 90% complete, with an hour or two left. The entire front suspension and Baer brakes are done except for the front sway bar mounting. In the rear, Factory Five welded our Panhard bracket in the car ahead of powder coating. To get the rearend in place, we needed to remove the driver's side floater assembly and perform a well orchestrated maneuver of swinging the rearend up and over the small opening for the axle tube, then bringing up the passenger side. About 80% of the engine bay cabin metal is drilled. 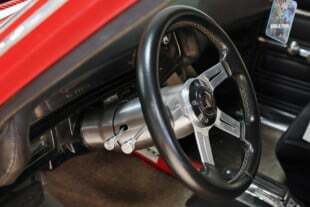 Factory Five assembles the Cobra/Challenge cars with a standard driver's foot box and includes three different panels specific to the Coyote kit. This metal will shrink the overall size of the pedal box to make room for the giant mod motor. The included rivet spacer tool is a big help for marking rivet holes. Our wheels are a new design from CCW, an 18-inch modular mesh-type where the centers and back barrel are one piece. The outer lip is bolted on. Our tires are Toyo Proxes R888 in a 275/35-18 front and 315/30-18 rear. This last Saturday the Stewart Transport big rig rolled up to deliver our Challenge kit. The process of unloading the car and parts took a little over an hour and was a breeze. That evening we went box to box and took inventory of all our big parts. On Sunday we dismounted the body, covered up some tubes with painter's tape, marked and removed the sheet metal, installed the front F panels, lower control arms, spindles, and sway bar. We could have completed the front suspension but our upper control arms are currently on back order. Due to an issue with Stewart’s Factory Five delivery truck, our drop off got pushed back one week to March 18th. Meanwhile, Moser finished up our rearend build that features Baer’s floater conversion, 31-spline axles, Eaton Truetrac differential, and Moser rear cover. Our billet INNOV8 individual throttle bodies also arrived. We received two different runner lengths so that we can tune our power band accordingly. Along with a set of upgraded COMP camshafts, we will revisit CPR Racing’s engine dyno before the engine is installed into the chassis. The rest of our Baer front and rear brake kit arrived. The Fire Red calipers will be an awesome accent on a otherwise colorless car. Our Baer floating axle conversion stopped by our office briefly for a few photos before heading to Moser for the 8.8 axle assembly. Today the Factory Five crew is making our sheet metal panels. Each panel is CNC cut, formed by hand, tested for fitment, then sheet metal screws are used to hold them in place. This way FFR can guarantee panel fitment. Since we are installing a Coyote, the foot box is slightly smaller to make way for the larger engine. Our Cobra arrived back from powder coating last Friday and this week the Factory Five team will be getting it ready for shipping. The expected ship date is next Monday. Also, our first parts arrived this week – a full Tilton pedal assembly, drive by wire adapter, master cylinders, bias adjuster, and more! Additional bracing to the three-link upper mount due to the power we are making.